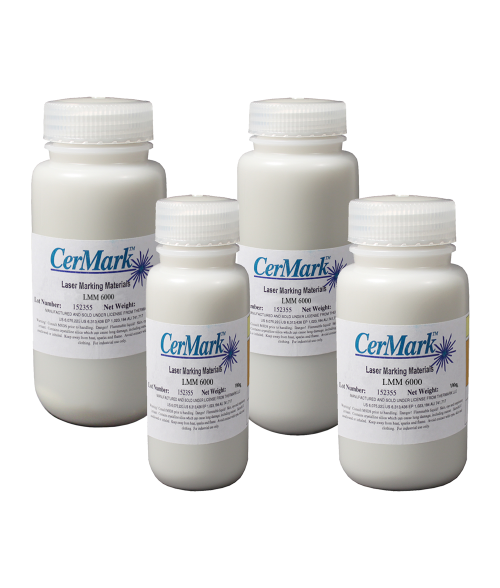 CerMark Metal Marking Solution creates solid black engraving on uncoated metals. The solution is brushed on to clean metal and then laser engraved. After engraving, wash the area with water to remove the unused solution. Available in 25g, 100g, 250g, and 500g bottles. The product is shipped as a concentrate and requires thinning with denatured alcohol. The 25 grams of solution will cover an estimated 250+ square inches when applied using a brush and an estimated 500+ square inches when applied using the spray method. Coverage (When mixing with denatured alcohol): Brushing 1:1 - 250 square inches, Spraying 2:1 - 500 square inches. Bottle is much larger than 25g, so may appear empty at first glance. The 100 grams of solution will cover an estimated 1000+ square inches when applied using a brush and an estimated 2000+ square inches when applied using the spray method. Coverage (When mixing with denatured alcohol): Brushing 1:1 - 1000 square inches, Spraying 2:1 - 2000 square inches. The 250 grams of solution will cover an estimated 2500+ square inches when applied using a brush and an estimated 5000+ square inches when applied using the spray method. Coverage (When mixing with denatured alcohol): Brushing 1:1 - 2500 square inches, Spraying 2:1 - 5000 square inches. The 500 grams of solution will cover an estimated 5000+ square inches when applied using a brush and an estimated 10000+ square inches when applied using the spray method. Coverage (When mixing with denatured alcohol): Brushing 1:1 - 5000 square inches, Spraying 2:1 - 10000 square inches. PLEASE NOTE: Air shipping is available for an additional Hazardous Materials Air Shipping Fee.